All my life, my name was my favorite thing; to me, it was unique, lovely and had a beautiful meaning. Even though it has always been hard for people to pronounce it, but they can recall me easily since they always remember my name is different! Thanks to my mom, who spent two weeks searching for such a unique name when I was born, with all its meanings and spellings and the story of Saint Evronia as well.. And even though some people have different spellings for the name, Evronia and اڤرونية are the most correct ones since they are documented in the Synaxarium and on Internet Encyclopedias. Every year on the 1st of Epip, I celebrate Saint Evronia's feast, as well as my baptism anniversary, since I was baptized on the same date... My parents did this so that I would always have nice memories about that day :) That's why I celebrate this day every year, as much as I celebrate my birthday, or even more! Through the years, I've been asked tremendously about the meaning of my name and about the story of St Evronia, that is why I'm writing this post. Evronia means: "the one with the right thought", or "wise" in Latin, and also means "pure" in old Dannish. 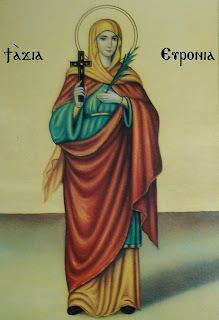 On this day, St. Febronia, the ascetic virgin, was martyred. This saint was the niece of the superior of a convent that had fifty virgins, in a place called "Ouryana" in Mesopotamia. Her aunt brought her up in the fear of God and taught her the reading of the Holy Books. 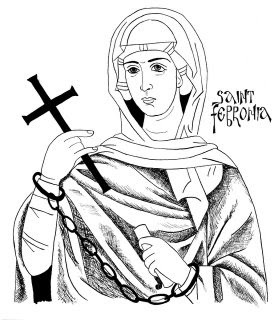 St. Febronia vowed herself to the Lord Christ, and she fought the good fight by asceticism, fasting for two days at a time, and unceasing in her prayers. When Emperor Diocletian issued his edict to worship idols, many Christians were martyred by his hands. When the virgins heard that, they were afraid and left the convent and went into hiding. None was left in the convent except St. Febronia, another sister and the abbess. On the following day, the envoys of the Emperor came, seized the abbess, and humiliated her. St. Febronia said to them, "Take me and set free this old woman." But they took her as well, bound in ropes, and brought them to the Governor. At that time she was twenty years old, and was attractive. The Governor asked her to worship the idols and promised her many things but she refused. He ordered that she be beaten with rods, and her dress to be torn off. The abbess cried out to him saying, "May God rip you up, O wild beast, for you want to put to shame this young orphan girl." The Governor was wrathful, and ordered St. Febronia to be squeezed by the wheel, and to comb her body with an iron comb until her flesh was completely torn. During all that, she prayed to the Lord asking for help. He then cut out her tongue and smashed her teeth so that she could not pray. But the Lord strengthened her and comforted her. Finally, the Governor ordered her head cut off, and she received the crown of martyrdom. A righteous man took her body and shrouded it with costly shrouds, and placed it in a golden box. The very first picture of St Evronia in this post (with the Coptic letters) is Egyptian and it was sent to me by Father Rofail Ava Mina, he actually sent me a whole pack (I love him a lot! he's always liked discussing my name with me as well as talking about history of related saints, he's an amazing researcher!)... The picture is also available sometimes at St George Church library in Sporting, Alexandria. If you need a hard copy of it, email me with your mailing address and I'll make sure to send you one, wherever you are! I have even tried to write a hymn about St Evronia around 6 ot 7 years ago, and it wasn't that bad, they even once said it at church, but it actually had complete violations for Arabic poetry rules! I'm not good at Arabic poetry anyhow! I've written this post from information and stuff I collected throughout my life, there was no similar information available on the Internet about St Evronia that provided full details and icons for her... I hope I can spread her name and story everywhere because she is so great! I am so happy with your post.. the link is really amazing!! there are a lot of very nice information I have found on this link..! what is the meaning of Febronia in Italian? Febronia: she who burns with love. so giuseppe, why do you think "Febronia" meaning is different from "Evronia" meaning? Giuseppe Maggiore, via vincenzo auteri, 6 - 95046 Palagonia (CT), Italy.